Compliance Corner is a quarterly electronic newsletter published by the MSRB to support the compliance obligations of brokers, dealers and municipal securities dealers (collectively "dealers") and municipal advisors. 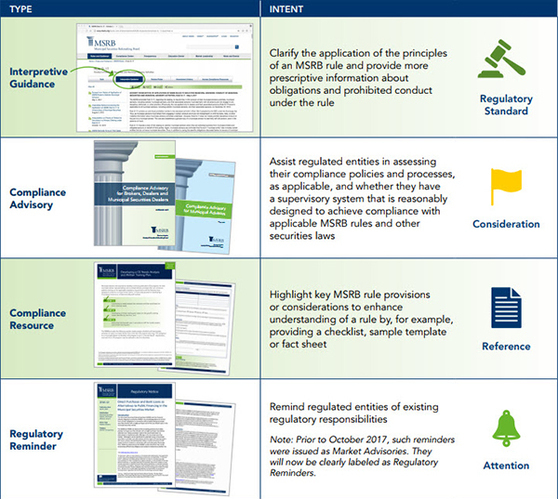 Compliance Corner provides regulatory updates and resources to facilitate understanding of MSRB rules. The purpose of this request is to jumpstart a long-term dialogue with stakeholders on how the MSRB can most effectively facilitate compliance. We welcome preliminary input to help us begin to focus our efforts, as well as continued comments from stakeholders throughout the year. Read the full request for comment and submit your responses by Friday, February 9, 2018. Q: What are the different types of compliance information the MSRB provides, and how can firms use the information? A: The MSRB provides ongoing compliance information to supplement understanding of its rules by dealers and municipal advisors. The table below explains the type and intent of various forms of compliance information. Download the printable version. The MSRB separately engages in various market leadership activities in support of its mission to protect the integrity of the municipal securities market. Dealers and municipal advisors should note the following key compliance dates and deadlines relevant through the first quarter of calendar year 2018. All dealers and municipal advisors must provide a written notification to customers and municipal advisory clients with a statement that they are registered with the MSRB and the Securities and Exchange Commission (SEC); the MSRB’s website address; and a statement as to the availability of the Information for Municipal Securities Investors and/or Information for Municipal Advisory Clients brochures. This notification must be provided once each year. See MSRB Rule G-10. Within 90 calendar days after a municipal advisor firm’s fiscal year end (calendar year end for sole proprietors), the municipal advisor firm must file an “annual update,” which is an amendment to the municipal advisor firm’s SEC Form MA, that either confirms the information is accurate or updates responses to any item for which the information is no longer accurate. See SEC Rule § 240.15Ba1-5. Amendments to MSRB Rule G-3 on continuing education requirements for municipal advisors have an implementation date of January 1, 2018. Under amended Rule G-3, municipal advisor firms are required to complete a needs analysis, develop a continuing education training plan for their covered persons and deliver applicable training to all covered persons by December 31, 2018. See MSRB Rule G-3. Each January, all dealers and municipal advisors registered with the MSRB are required to affirm or correct their registration information on MSRB Form A-12. See MSRB Rule A-12. The MSRB received approval from the SEC in July 2017 to amend MSRB Rule G-26, on customer account transfers, to modernize the rule and promote a uniform customer account transfer standard for all dealers. The amendments will be effective on January 29, 2018. View the approval notice. Recognizing that the MSRB’s professional fees are calculated on the number of active Forms MA-I a municipal advisor firm has on file with the SEC as of January 31 each year, the MSRB recommends that firms review the accuracy of their Forms MA-I before January 31, 2018. See MSRB Rule A-11. Share your perspective about how the MSRB can most effectively facilitate compliance with its rules to protect investors and municipal entities, and promote market efficiency. The purpose of this request is to jumpstart a long-term dialogue with stakeholders on how the MSRB can most effectively facilitate compliance. Read the request for comment and submit your response by February 9, 2018. On an annual basis, the chief executive officer or equivalent officer at each municipal advisor firm must certify that it has in place processes to establish, maintain, review, test and modify written compliance policies and supervisory procedures reasonably designed to achieve compliance with applicable rules. See MSRB Rule G-44. Mark your calendars. The MSRB recently launched a series of virtual compliance workshops designed for dealers and municipal advisors. The free webcast workshops will follow a question-and-answer format and will feature in-depth discussions about key provisions of MSRB rules. To submit questions in advance of any workshop or to suggest topics for future workshops, email MSRBEvents@msrb.org. Register for each workshop below. The MSRB supports regulatory compliance by providing interpretive guidance, checklists, sample templates and other resources about municipal market regulations. The latest resources are listed below and available in the MSRB’s online Compliance Center. Resources labeled “MA” are for municipal advisors; “BD” for dealers; “MA/BD” for all. Coming Soon: The MSRB plans to file with the SEC proposed new MSRB Rule G-40, on advertising by municipal advisors; and proposed amendments to MSRB Rule G-21, on advertising. The amendments to Rule G-21, applicable to dealers, will update and harmonize the rule with certain provisions of the advertising rules of other financial regulators. Upon filing, the information will be available here. November 7, 2017: Amendment Filed with the SEC on Proposed Changes to MSRB Rule G-34, on obtaining CUSIP Numbers, to Modify the Proposed Principles-Based Exception for Certain Sales of Municipal Securities. Through December 31, 2017, dealer and municipal advisor firms can enhance their continuing education programs for municipal finance professionals by purchasing the full MuniEdPro® course catalog at the discounted rate of $100 per person. MuniEdPro’s interactive, online courses may be used to help fulfill the firm-element component of continuing education requirements for regulated entities depending on your firm’s annual written training plan. For more information about MuniEdPro® or to inquire about taking advantage of the introductory rate, contact Ritta McLaughlin at rmclaughlin@msrb.org or 202-838-1306.